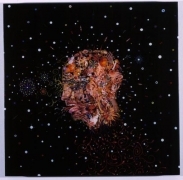 James Cohan Gallery is pleased to announce an exhibition of new paintings by Fred Tomaselli. 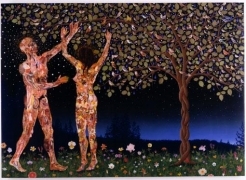 Tomaselli's new works are richly layered collage and painted surfaces incorporating plant life as well as images from anatomical illustrations, magazines and nature guides. The paintings draw on such varied influences as Tibetan Thangkas, Indian miniatures and the 16th century Italian artist Guiseppe Arcimboldo. Similar in spirit to Tomaselli's earlier work which referenced the relationship between the sub-culture of psychedelia and utopianism, these new paintings expand the dialogue into a fictive landscape where figures populate a frenzied, cosmic and other worldly universe. 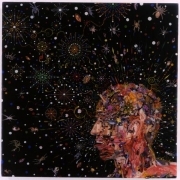 Fred Tomaselli was born in Santa Monica, California in 1956. 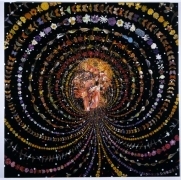 Since the late 1980s he has had innumerable solo and group exhibitions in museums and galleries throughout the world. 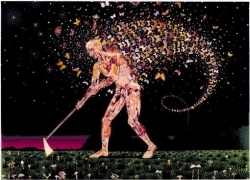 Tomaselli was included in the Lyon Biennial in 2000 and the Liverpool Biennial in 2002. 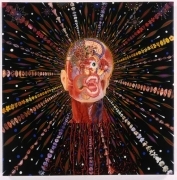 Recent museum exhibitions include Fred Tomaselli: Ten Year Survey at the Palm Beach Institute of Contemporary Art, Florida in 2001; Painting Pictures at the Kunstmuseum Wolfsburg, Germany in 2003; and Shine at the Museum Boijmans Van Beuningen in Rotterdam, The Netherlands in 2003. exhibitions exhibitions include a solo show at the Albright-Knox Gallery of Art in Buffalo, New York opening in Fall 2003 and a European museum tour beginning in 2004 at The Fruitmarket Gallery in Edinburgh, Scotland. 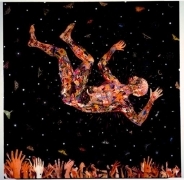 Tomaselli lives and works in Brooklyn, New York.